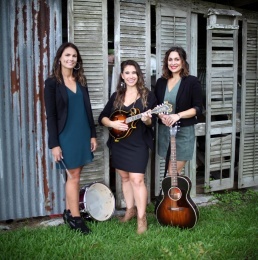 The all female, award-winning band, Sweet Cecilia, is a family trio from Cecilia, LA. Their music is deeply rooted in country, rock, folk, and Cajun influences. Their three part harmony is rich and sultry. These three women are not only accomplished vocalists, but musicians and master songwriters. Their original songs will invoke tears, laughter, and joy. Sweet Cecilia was formally created in 2012. However , sisters Laura Huval and Maegan Berard, along with their first cousin, Callie Guidry, have been singing and making music together since childhood. It all started with their late father and uncle, Al Berard (Grammy nominated musician) , encouraging them at a young age to pursue music. They keep the music fresh and modern, while holding on to their musical roots and traditions. Sweet Cecilia is making their presence known in the Americana and Regional Roots world. 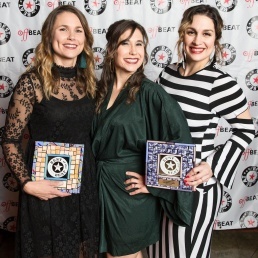 Sweet Cecilia won the OffBEAT MAGAZINE “Best of the Beat Awards 2017” for “Best Country/Folk/Singer-Songwriter Artist” and “Best Country/Folk/Singer-Songwriter Album” (Sing Me A Story). “Sing Me A Story” was also on OffBEAT Magazine’s Top 50 Albums for 2017. The group also received the 2018 “Times of Acadiana” Best Award for one of the top 3 Best Local Country Groups. “Sing Me A Story”, is their latest release. It was produced by Sweet Cecilia and six-time Grammy winner, Tony Daigle. The album features all original songs with guest musicians Sonny Landreth, Eric Adcock, Gary Usie, Lane Mack, Jordy Guidry, Caleb Elliot, Adrian Huval, Brazos Huval, 504 Horns, and Tony Daigle. Read OffBeat Magazine’s review of the album here. Their self- titled debut album was named one of the top 50 in OffBEAT Magazine in 2015. Sweet Cecilia has performed at Festival International de Louisiane in Lafayette, Louisiana; the world famous Breaux Bridge Crawfish Festival in Breaux Bridge, Louisiana; French Quarter Festival; the New Orleans Jazz and Heritage Festival in Louisiana, and many more venues across the gulf coast.